We left Clarence Town about 7:30 am. We planned to go about 60 nm and wanted to arrive before dark. 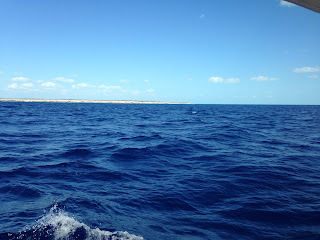 We had excellent wind for sailing today, north east at about 13-15-20 knots. So we were able to sail at 7k most of the day. And we didn’t have the waves crashing over the boat today. Much more sane. After our sail to Clarence Town, we even had dried salt on our cockpit table. Dave gave the boat a good scrub yesterday. As we were putting out our fishing lines, I asked Dave if he was afraid to eat the mahi after he got sick. He said “No, bring it on. I’ll eat it til I squirt. That’s always been my motto.” But we did do some research on ciguatera poisoning. Ciguatera toxin is produced by dinoflagellates found in the coral reef. When the fish eat the coral, the toxin concentrates in the fish organs. The larger reef fish that eat the smaller reef fish build up toxins in their body. That’s why we avoid barracuda, but we are hearing about it in other fish, like hogfish and black grouper to name a few. Symptoms range from flu like symptoms to joint pain to shock and coma. And it will recur with greater intensity with each exposure. There are no reliable tests, but a researcher had luck with putting a piece of raw meat under his tongue. If it tingles, don’t eat it. So I guess that’s going to be our guide. Wish us luck! While we were in route, Dave realized we had to change the SD card for our chart plotter. 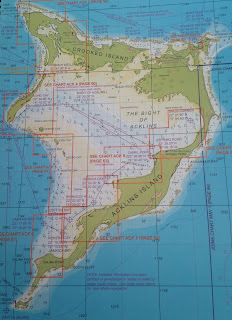 Now our chart plotter covers Central and South America. That’s cool. About noon, Dave saw a whale breach about a half of a mile from our boat. I only saw the big splash it made. We never saw it again, shucks. 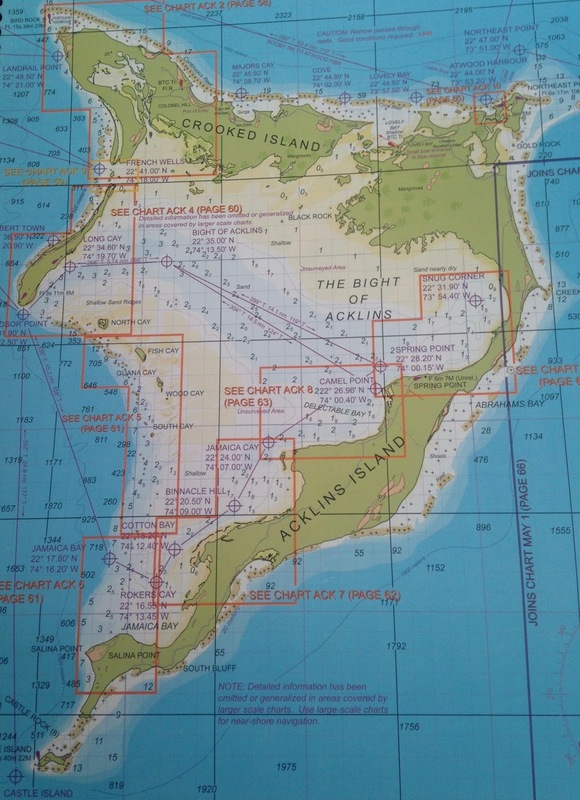 We reached the group of islands known as the Crookeds and Acklins about 3:00. 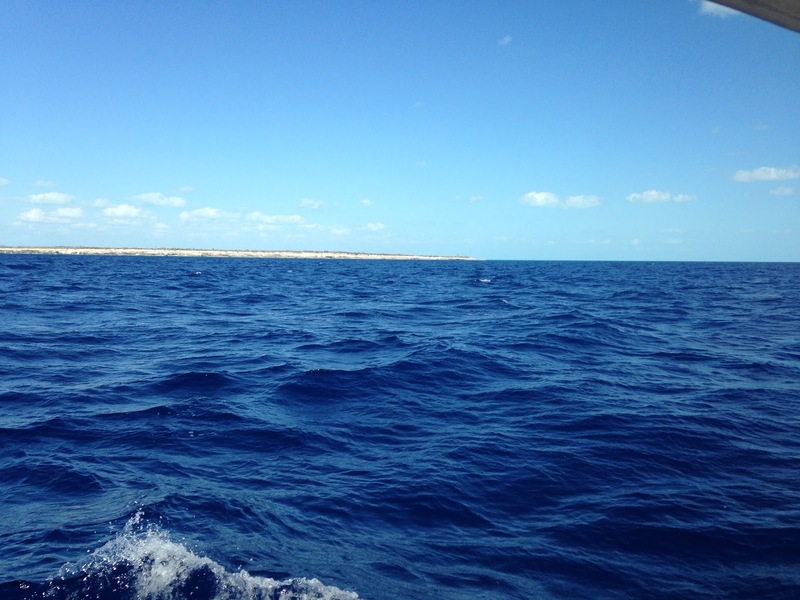 We rounded the southern tip of Long Cay and were anchored on it’s east side by 3:45. There was one other boat anchored there. And one more arrived before sunset. I realized today that we crossed the Tropic of Cancer last Thursday as we traveled south along Long Island. So we are officially in the Tropics.